Is your business in the clouds? 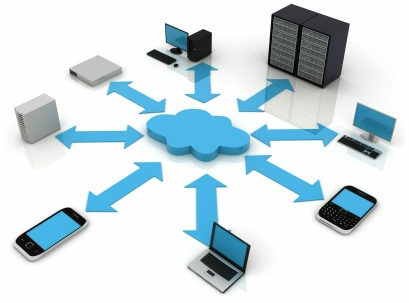 Are you using some form of cloud computing in your company? If not, you probably will be not too far into the future so you need to be learning about it. About half already use some form of cloud computing in their company. 83% said they expect their company to rely on cloud-based computing services within 3-5 years. Cloud computing is here and it is here to stay. 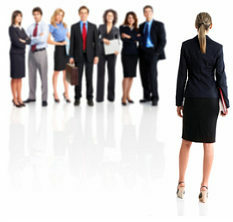 Business executives like the cloud computing concept of “pay as you go”. Outsourcing is certainly nothing new and the cloud gives companies additional outsourcing opportunities as they strive to keep costs in line. I have to say I like it too. For example, a CIO in a small company struggles to have the critical mass of infrastructure and systems technical expertise to manage a data center, support a network and all the systems of the company. Even when they do, there is constantly a risk if a key employee goes out sick or leaves your company. 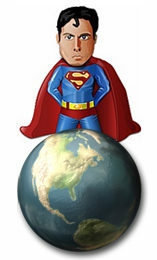 Why not outsource your data center? This becomes more and more compelling when you look at the full cost of keeping everything “in-house”. People cost with specific technical expertise – It is hard to maintain critical mass of all the technical expertise you need in a small company and it can be more expensive. Systems that depreciate and become obsolete – Let someone else make a home for your systems who can better staff and provide the controlled and secure environment you need for them. Equipment that depreciate and can break – Might be nice to let someone else worry about this who has the critical mass to support it effectively. Utility cost to manage the heat created in a data center – Your data center is one of the biggest users of energy in your company. Outsourcing your data center can have a big impact on monthly utility expenses. Redundancy required to insure 99% up-time – It’s expensive to have redundant systems and people to create an environment that stays up 99% of the time. Security can be enhanced – Outsourcing your systems, software, or data to a cloud service can enhance your security by taking advantage of a company who is able to afford a more robust security environment. In the old days you wouldn’t have thought much about outsourcing your software, much less the data center. But in today’s environment, companies who can create a critical mass and are focused on specific services for other companies can be a big plus for all of us. Cloud computing allows us to focus on the expertise we really want and need in our company and rely on a 3rd party for the expertise we would rather have somewhere else anyway. Managed appropriately, cloud computing can offer your company a more cost effective technology environment, more secure, and with higher reliability. Still, , , any environment must be managed, , , otherwise it can turn into a disaster. Here is a final thought for you. Google and Amazon use cloud computing quite heavily, , , why do you think they do? The answer is pretty obvious, , , it is more cost effective to use outside services of companies who make it their mission to provide such services. That’s the 3rd party company’s core competency, , , Google and Amazon don’t want to be the experts in this area. It is less expensive and more reliable to use outside experts, , , for some things, , , not everything. Get ready to push the cloud button, , , it’s coming. The 3-day BIG OFFER we promoted in early December was so successful we decided to make the bundle a permanent item. Every IT manager should have these tools to achieve more success. My entire library of 14 IT management e-books. 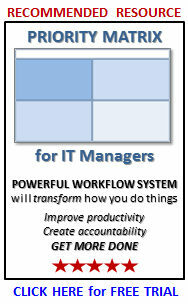 Practical and to the point to help you achieve more success, , , used by thousands of IT managers around the world. 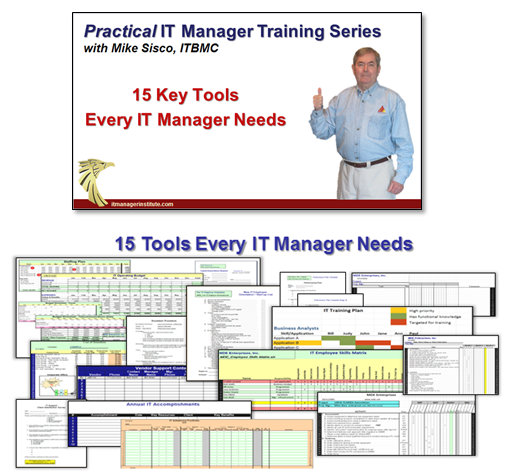 Over 100 IT manager tools and templates developed from my 20+ years in managing IT organizations. Simple, practical and they work, , , you can even customize them to meet your specific needs. A comprehensive online training library of 82, 20-minute e-Learning sessions from the 20 Minute IT Manager. Covers virtually every aspect of managing a successful IT organization, , , over 25 hours of training. Learn about one of the most serious issues facing CEO’s and CIO’s today and why our work behavior plays such a significant role, , , a real eye-opener and information every IT manager needs to know. I’ve led the IT due diligence on 45 company acquisitions and developed an IT due diligence process and tools to boost my productivity in conducting an IT assessment. Gain valuable insight from my experiences in this 25-page Executive Report. Knowledge empowers you to achieve more ! 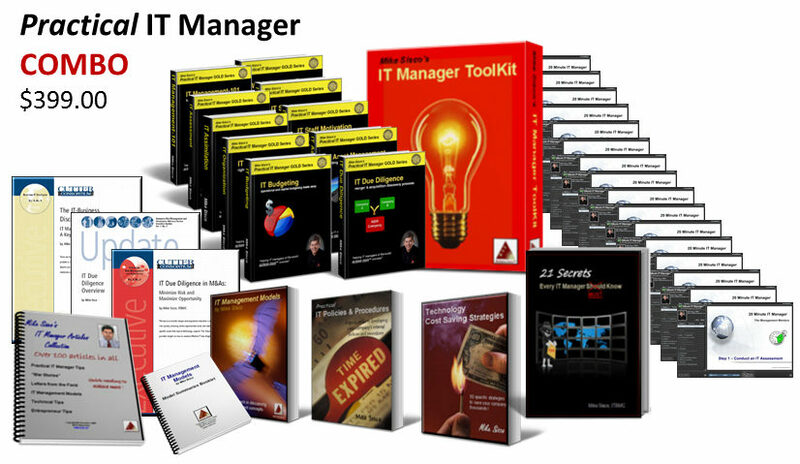 This bundle of IT manager training materials is the most comprehensive I’ve ever offered and represents over 20 years of IT management experience and thousands of hours of development work designed to help IT managers achieve more success. Would you like anyone who has access to your company Intranet be able to access any of the tools, e-books, or online training? First of all, there is no perfect way to prioritize the work you have your IT organization focus on. If we were to conduct an IT assessment and 20 IT managers all came up with exactly the same findings, , , i.e., the business needs and issues and the capability and capacity of our IT organization, , , and then we ask them to prioritize the work, , , guess what! There would be 20 different sets of priorities. Prioritizing work is a bit more art than science. That’s actually perfectly OK, , , every one of the 20 managers could have an appropriate strategy for the company. We just all see things a bit differently. The key is to develop a strategy, present it to management and gain their approval, , , do this and you are in sync with the business. I use a simple approach to prioritize the work I determine is needed for us to focus on. Let me repeat something before I give them to you, , , every situation is different so this list is a general guideline I use. There are always exceptions and variables you must consider, , , your final set of priorities will be somewhat subjective, not totally objective. I use the following as a general guideline to follow when I prioritize projects. It doesn’t happen very often but when it does, what a PAIN !! My Desktop PC is having a bad couple of days, , , and that means, “I’m having a bad day.” Troubleshooting PC issues is not what we are supposed to spend our time on as managers, , , but when you are a small business like me, , , I’m the one who usually must troubleshoot technical issues. When I have PC problems, they always seem to occur when updating software. In this case, I updated my virus and spyware prevention software with new definitions and I discover there is now a conflict with a sound card driver on my old but proven XP system. I finally learn what the issue is after several reboots, , , Google searches, , , and vendor software support research to narrow down and isolate the issue. Yep, , , it apparently a software update. Interesting, , , I’ve made these same type of updates many times before with no problem, , , but all of a sudden my system is partially paralyzed. The good news is that I can do some things like get to the Internet and send email but not the things I really need to do to troubleshoot this issue further like opening Windows Explorer, , , removing a piece of software, etc. These tasks lock up my system. OK, I think I’ve resolved the issue, , , but now I need to replace my virus software, , , or fix the incompatibility issue I learned about with the problematic software, , , but now I’m a bit reluctant to continue using it. You see, they have lost my confidence. What worked so well for several years has cost me time and money, , , and I don’t like it. The reason I bring this problem up is that when your IT team releases software and you have compatibility issues or something doesn’t work quite right, , , it causes a lot of frustration for your users. Don’t lose your client’s confidence in you by releasing software changes that don’t work. Test, test, and re-test, , , and if possible get the client to participate in the testing so they have some skin in the game. Reducing problems saves everyone a lot of pain and makes life better. Back to my PC situation. I know, , , it’s time for me to trade this one in, but I hate to spend the time and effort required to reload all my software and update a new system. Still, , , a newer system will be more up to date, faster, , , and offer some advantages over what I have today. It would also have probably avoided yesterday’s problem so no one to blame but me. I can’t complain really. This Dell system I have is 10 years old and it has been a true workhorse because I work all hours of the day and night and this system is constantly running. Guess I need to start looking to see what options I have for replacing this one, , , need to give it some thought so it’s a good long term solution. 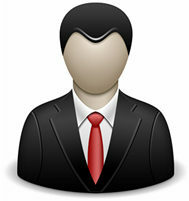 Register by February 15, 2011 and receive a substantial discount on your IT Manager Institute registration fee. My last post discussed “Project management lessons from sidewalk art”. I try to observe and learn from most of the things I see and do. 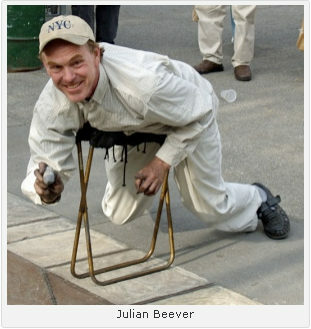 When watching a TV show depicting Julian Beever and his 3D sidewalk art, there were definite signs of good project management as noted in the ITLever post. Another project he did in Philadelphia helped celebrate the 4th of July, , , our Independence Day. This one is amazing, , , looks like a young girl is riding an eagle that is standing over the American flag. 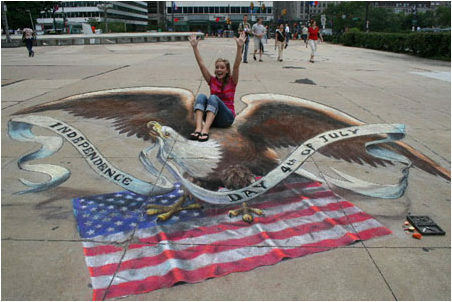 The flag looks so real, but it’s just chalk art. Look closely and you can see the sidewalk cracks in the entire drawing. Watch the YouTube video of Concrete Canvas and see if you can pick up the project elements as Julian goes about developing this one in 3 days. CLICK HERE to watch the video. But before we leave, there is a message with this article’s title, “Fly with eagles”. Eagles soar high above all other birds. They are stronger and rule the skies. Are you preparing your team to soar with the eagles or to simply get by as an average manager like all the rest do? Make a decision to develop your management skills and soar with eagles and find out for yourself how much better the view is from above the pack. 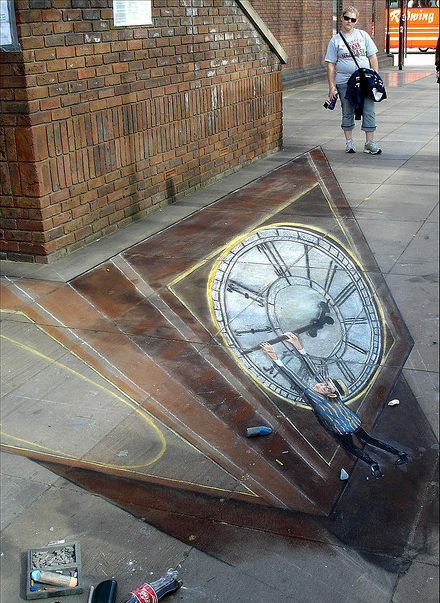 I’m constantly amazed when I run across Julian Beever’s 3D sidewalk art. 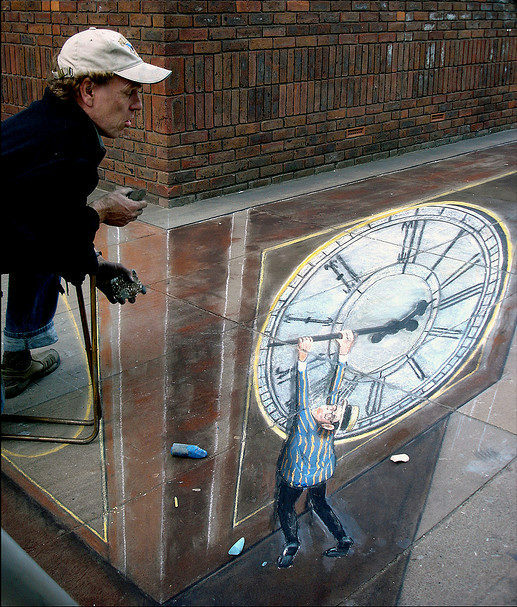 He is probably the best known of the sidewalk artists out there and even has a TV series titled Concrete Canvas. I accidentally came across a couple of them over the weekend while working very late one night. 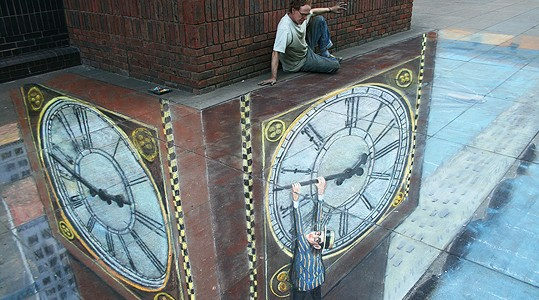 Below are photos taken during and after Julian’s 3-day creation of Big Ben on a London sidewalk, , , all done with chalk, a good sidewalk location, , , and lots of imagination and creativity. 1. Prepares for the project and develops a plan – He checks the weather, insures he has permission to draw on the sidewalk, creates a mock-up on paper, checks all of his equipment and materials and determines exactly what he has to accomplish each day to complete the project in 3 days. In other words, he puts a plan together just like you should with any project. 2. Anticipates problems – When it rains, he can’t work so he carries a tarp and masking tape to cover his work so it won’t be destroyed by rain drops. Remember, he uses chalk. 3. Checks and rechecks the status of the project – By using a camera, he looks through the lens to determine if he is getting the 3D effect he is looking for every step of the way. 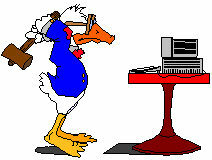 He is also aware of where he is and how much time remains to complete his drawing, , , good time management. 4. Knows where the bottlenecks are – Julian knows exactly what he has to do and he knows where the parts of the drawing are that will take more time. He also knows where he can take a shortcut if necessary to gain some time. 5. Uses tools – Julian uses a special folding stool with flat seat and lays on it as he draws. It allows him to hover over his masterpiece without damaging his work. It improves his productivity and saves his knees, , , but most importantly makes the work easier for him to do. He began using this tool to address several issues he faced when working on sidewalk art projects. Find more sidewalk art posted in ITLever by doing a search on “sidewalk”. Great news!! Our broken heater I talked about in my last post is now fixed, , , and what a pleasant experience. There are valuable lessons in this one that apply to managing your IT organization. No, we don’t hate it, , , of course not, , , we LOVE IT !! My heating guy is “Mike”, same name as I have. We had never met him but he was referred to us by a close friend. We called Mike last Thursday to come take a look at our downstairs heating unit that had gone out, , , and it was very, very cold with a forecast of lower temperatures coming. First of all, he says he will be right there and he arrives within 30 minutes, , , pretty quick, , , we are off to a good start. He analyzes the situation and calls me out to “take a look”. Anytime, you have to go “take a look”, there are problems in my experience. Sure enough, the heating elements are cracked and the motor had burned itself out. The good news is that he has already checked with the manufacturer and learned that the unit is still under its 10-year warranty, , , for 2 more months. WOW, what a lucky break. The “not so good news” is that he has to order the parts and it will be next week before they will arrive so he can make the repairs. When asked about what the cost will be, he explains briefly what has to be done and estimates the total cost will probably be somewhere around $500 to $700. If it had not been in warranty, we would be looking at several thousand dollars. Before he leaves and this is important, Mike has set my expectations on when the unit will be fixed and how much it will cost – sometime next week as soon as the replacement parts arrive and around $500 to $700. Tonight is going to be down to 12°F, , , so we do what we need to do to stay warm downstairs by using our fireplace and running the water slightly to keep the pipes from freezing. We have prepared ourselves to manage without the heating unit for a few days. This morning, Mike calls to tell me they have the parts and can come by to make the repairs. WOW, it’s only Monday morning and I’m thinking it could be Wednesday or Thursday before he gets the parts. Great news. After he completes the work, I inspect the repairs and we run a good test of the unit. He points out a couple of additional things they took care of that would make the heating and air unit more effective. It was small things that most people would not have addressed and something they certainly didn’t have to do. He took care of it because he cared. I later learned that he didn’t charge me for these two little fixes although I would have been totally fine if he had. 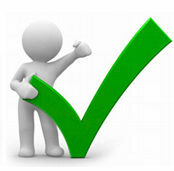 When presented his invoice, the cost was under his estimate, , , more GREAT NEWS. Do you think I’m a happy client? You better believe I am, , , in fact, I plan to tell several more people about the good work Mike’s company does. And who do you think I call the next time we have heating or cooling issues? You got it, , , Mike is the only person I would think of calling. Mike’s company exceeded my expectations! Your IT organization should provide service at this level. If you do, I can assure you there will be lots of happy clients who like to talk about how great your team performs. Those are the best salesmen you have, but you know what, , , you earn their positive comments and remarks when you provide excellent support. No wonder my friend Terry is so positive about recommending Mike. Well, Mike now has another promoter in me; I plan to tell everyone I know who might need his services one day. Consider the alternative for a moment. If Mike had done a poor job in any area of time frame, cost, not keeping me informed, , , do you think I would be so positive in telling others? If you analyze the situation just a little, you can see that Mike positioned himself to over deliver. I’m sure he had a good idea when the parts would arrive and how much his labor cost would be. His time estimate was “sometime next week”. I would have been happy with Thursday or Friday, , , I’m ecstatic about the job being done today (Monday). The fact the cost came in 10% under his lower estimate of $500 also makes me very happy, , , I fully expected the cost would be somewhere around his upper estimate of $700. I’m always impressed with good support and good service. It could be as in this situation with Mike, getting support from a hotel IT technician (click here to read the post), or even in a restaurant. Good service creates positive energy around your organization. Guess what, most people are impressed with excellent client service, , , because that’s not what you usually receive. Focus your team and teach them how to set expectations so you can deliver excellent client service, , , then note the positive difference in working with your clients.